I am used to doing this in Windows with FireFox or IE by pressing Ctrl + F5. Is there a way to do this for Safari on a Mac? Go to Safari > Empty Cache, or hit Option+⌘+E. To refresh, click the refresh button on the addressbar or press ⌘+R. Another tip. If you want to restore Safari, like completely clear all the caches, or parts of it, go to Safari > Reset Safari. I use it usually when I need to clear a lot of memory from Safari, for it will clear the webpage screenshots, the cookies, the favicons, etc. Edit: On the latest version of Empty Cache isn't on the Safari menu any more. It's now on the Develop menu. 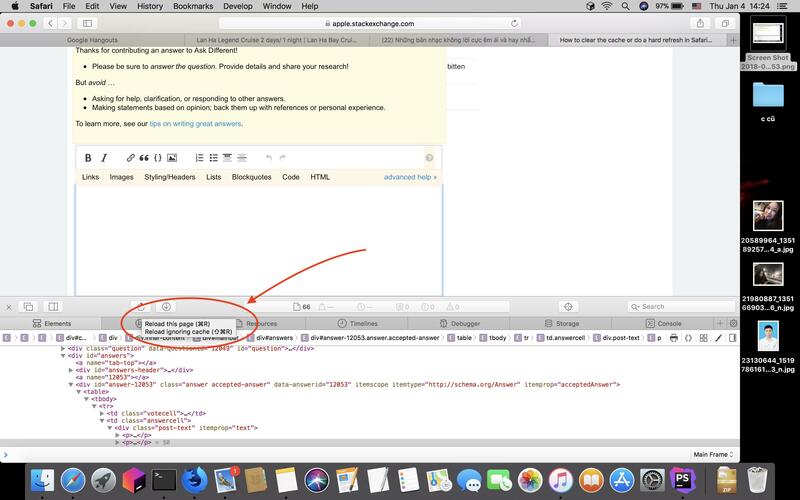 To show the Develop menu it, go to Safari > Preferences..., click the Advanced tab, and check Show Develop menu in menu bar. The keyboard shortcut remains unchanged, though. Safari > Reset Safari isn't an option any more. To clear history you can use History > Clear History... and to clear cookies/local storage data, go to Safari > Preferences..., click the Privacy tab, and either click Remove All Website Data... or Details... to view and remove it for individual sites. Shift and clicking the Refresh button generally does a full refresh. You can also empty cache with option command E, and then refresh. If you haven't already, enable developer tools: open settings (Cmd + ,), go to the advanced tab, and check the box that says "Show Develop menu in menu bar." If you want to disable caching (for example, if you are developing a website and need to consistently reload changes to files on your site) you can do so: Develop > Disable Caches. Select this option again to reenable caching. You must click References->Advanced->check to Show develop menu in menu bar. Later in Inspect Element press ShiftCmdR. Note: Your mouse must click into the element within "Elements tab", then you can press Shift+Cmd+R. on Safari version Version 11.1.2 (13605.3.8), it seems to be Opt+Cmd+E. You can check by open up Develop menu on top > look for Empty Caches item on the drop down list > see what the shortcut is. This is the correct answer for people looking for Safari's equivalent for ⌘ Command⇧ ShiftR in Chrome. This works for both Safari and the Web Inspector when connected to an iPad/iPhone. Keep in mind this does not clear cache, it simply does a "Hard Refresh". If you are use safari browser in windows, then ctrl + alt + e use for empty cache. Not the answer you're looking for? Browse other questions tagged safari refresh . How do I truly flush Safari's cache? How to clear the cache or do a hard refresh in mobile Safari? Is there a way to disable web page auto refresh in Safari? How to clear browser cache for just one specific site in Mobile Safari? 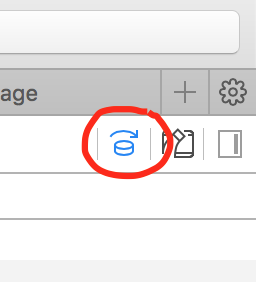 Clear iOS Safari icon cache? How to solve blank Safari Window / Safari crash (10.1.2)?